A version of this article was also published in the City of Daegu's English language newspaper In Daegu. As the demand, cost and availability of energy continues to rise, cities that invest in clean, green sources of energy are building a sustainable future for themselves and their inhabitants. Last year, South Korea announced its intention to spend 40 trillion Won to support the development of clean and renewable sources of energy between now and 2015. The Korean government wants to become one of the world’s top five clean energy economies. Such a commitment to clean energy greatly benefits many cities in Korea. Here we showcase the City of Daegu in Southeastern Korea. As the third largest city in the country with a population of 2.5 million, Daegu has already made significant strides of its own in the field of renewable and green energy technology. recognition as an ISCI "solar city." 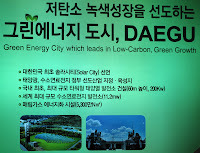 Daegu joined the International Solar Cities Initiative in 2003 and, in 2004, hosted the first International Solar Cities Congress. In April 2011, “Solar City Daegu” held its 4th annual Green Energy Expo at the EXCO center with international participation almost 400 companies and 40,000 attendees. The Expo showcased a number of initiatives currently underway in Daegu (including the EXCO center itself, whose renovations will produce over 1.1 million kilowatts of electricity from renewable energy sources). Let’s showcase a few initiatives. In the works since 2008, Korea’s first solar power tower project by Daesung Energy will deliver 200 kilowatts of energy via a solar heat concentrating system to the city’s grid this fall. This solar power system will be the largest solar energy plant in Korea. Additionally, Daegu is home to a landfill gas-to-energy facility that, since 2006, has provided the city with 1.5 megawatts of energy per hour. Designated as a UN Kyoto Protocol “Clean Development Mechanism,” this project prevents over 300,000 tons of carbon dioxide from being released into the atmosphere. from discarded fibers pictured here. Other exciting innovations were showcased at the Expo that should be implemented in Daegu and in other cities around the world. 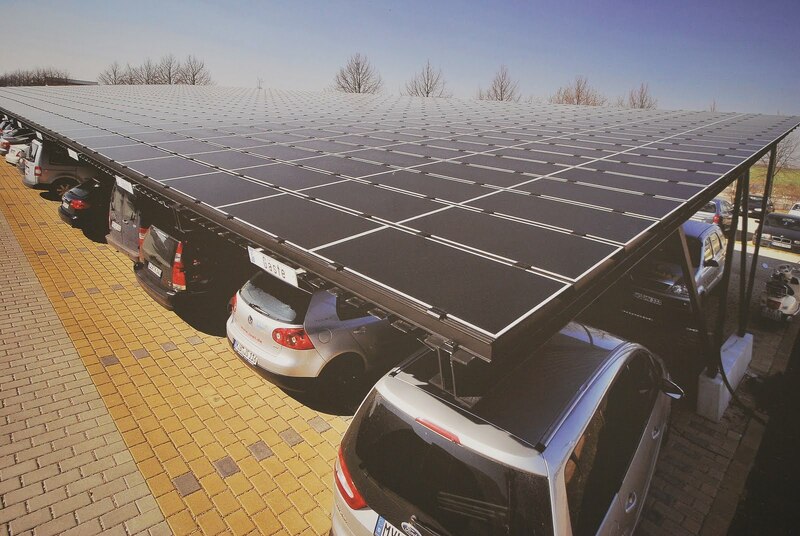 These include street lights that generate their own power via a small solar panel or wind turbine perched at the top of the pole and car ports fitted with solar power roofs. Also be on the lookout for an innovative new “fiber board slate,” made by Hyundai Industrial Trident. While not a source of energy, this innovative process is reusing discarded fibers (trash) from the garment and textile industries in and near Daegu to create non-toxic corrugated roofing material. Looking ahead, Daegu will be the host city of the 2013 World Energy Congress in October. Until then, the city will continue to implement new and exciting forms of clean, green energy and promote innovative ways to reuse what is otherwise considered trash. As the technology for solar cells gets better and better, this form of clean, renewable energy will find more applications that take up less space and produce more electricity, to meet the energy needs of our homes, schools and businesses.